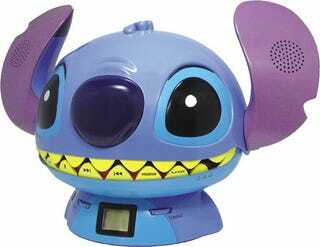 Fans of kitsch plastic gewgaws might find this Stitch radio and CD player from Runat so far up their street it's parked in their garage. Modelled on the Disney alien from the 2002 movie Lilo and Stitch, and most probably a tie-in for the upcoming anime series Stitch! it looks awesome with its mouth open—as you can see below.